This is the space to interact with our speakers, your fellow attendees, and virtual visitors from around the globe. Meet the Qualcomm Wireless Reach project partners in Kenya, Japan, and Indonesia who are joining TEDxSanDiego online for the livestream and live discussion. Tweet yourself into the Minglestream by posting your questions, reactions, and inspirations using #TEDxSD. 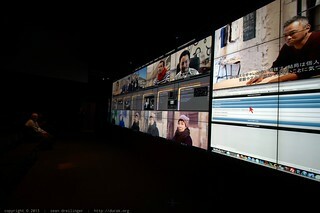 The Big Wall in the Vroom (Virtual Room) is a tiled display environment with four rows of eight displays for a total of 32 narrow-bezel NEC X551UN LCD displays with a 55" screen diagonal. Each of the displays has full HD resolution (1920×1080 pixels), adding up to 66 million pixels on the entire wall (15,360 x 4,320 pixels). We also support multi-channel audio, and use a four-camera optical tracking system from Vicon. All displays have been attached in 2×2 patterns to mounting structures, which are either installed in movable containers (OptiPortables) or suspended from above. The displays in the Big Wall are driven by 16 rendering PCs running CentOS Linux, each with dual Nvidia Geforce 580 graphics cards. Additionally, there are three separate control PCs (head nodes), each of them set up for one of the three supported software environments: CGLX, CalVR and SAGE.